For Vegetarian guests after vegetable our first choice is Paneer or Cottage cheese. 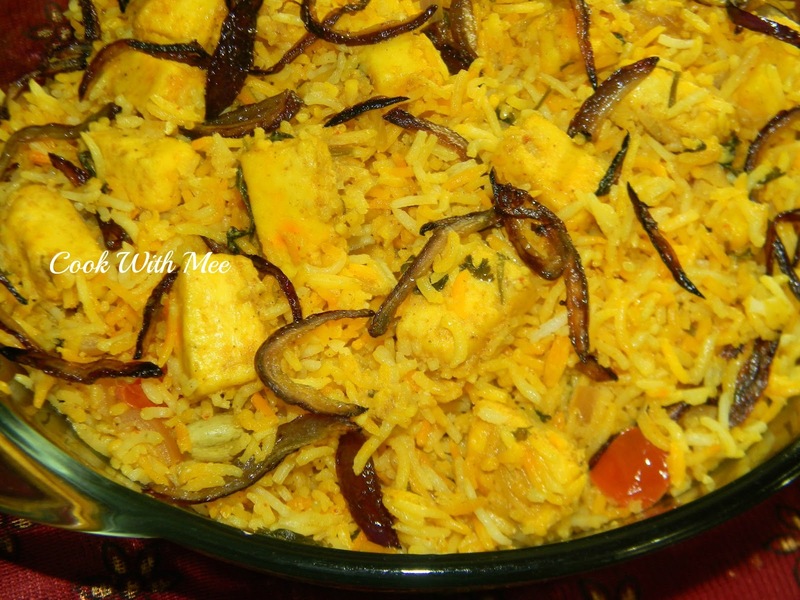 One of my vegetarian friends asked me for a Paneer Biryani because last time in my place he had vegetable biryani. But I didn’t want to cook in normal way so I searched few recipes in Google. 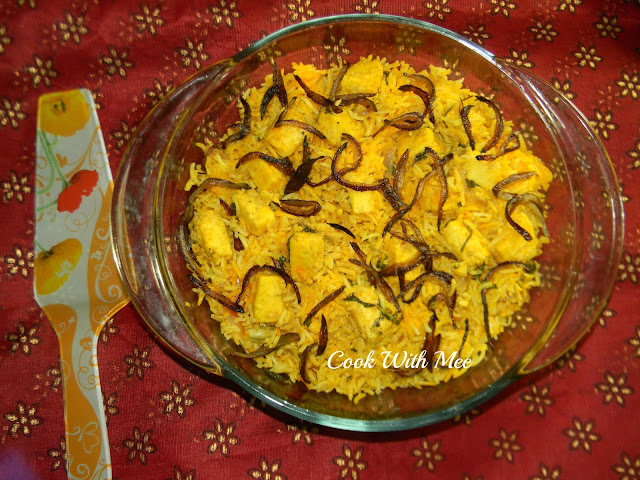 And really inspired with few recipes and specially with master chef Sanjeev Kapoor’s recipe. 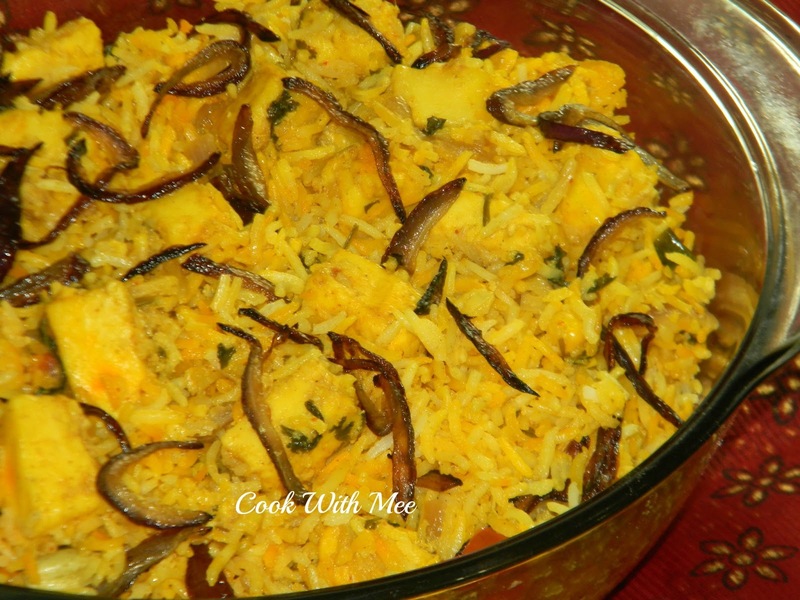 The new twist of this recipe is fresh Meethi Saag and corn niblets, which gave the dish a new flavor. Paneer makes any rice preparation very tasty but after adding the meethi the dish becomes completely different than any other biryani. My guest liked it so much. Saag in Rice really a innovative style which i never tried before. 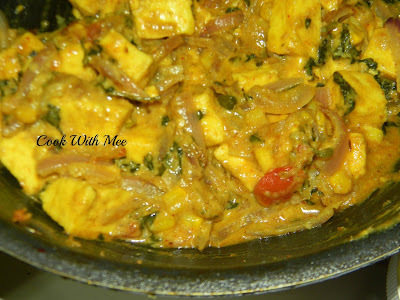 2.Paneer or Indian cottage Cheese: 100 gm. 5.One table spoon ginger and garlic paste. 6.Chopped methi leaves: A hands full. 7.Chopped Coriander Leaves: A hands full. 9.One table spoon corn niblets. 10.Red chili powder, cumin powder, Coriander powder, Turmeric powder (Half tea spoon of each item). 13.Half cup warm milk, Half cup cream. 14.Whole Garam Masala: clove 3, cardamom 2, cinnamon stick 1 small. 15.One tea spoon garam masala powder. 16.Chopped ginger one tea spoon. 17.Salt and sugar as per taste. Wash and clean the rice. 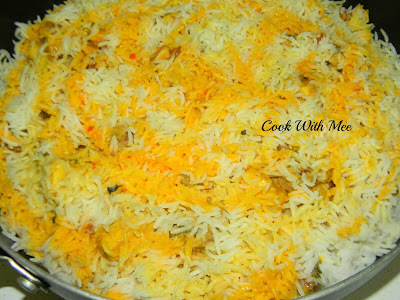 Now cook the rice with all the whole garam masala and salt till the rice 80 % done. Now soak the saffron stands in warm milk and keep it aside. 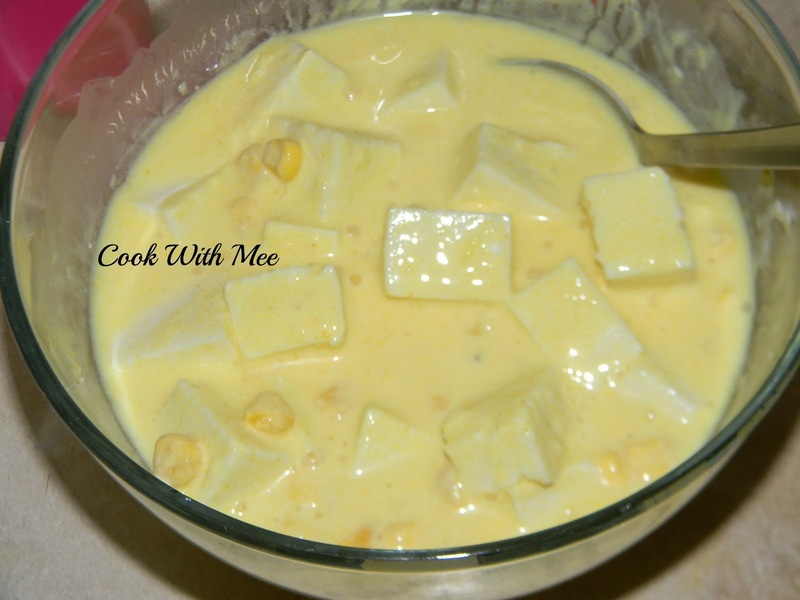 Cut the paneer in small cube size, now marinate the paneer pieces with corn niblets, curd, salt, turmeric powder one tea spoon ginger garlic paste for half 15 mints. Now take one vessel and add some oil slowly add the chopped onions and chopped green chilies sauté till the onions are transparent. Now add the chopped meethi saag and stir for some time. Next add rest of the ginger garlic paste and stir for some time. Now add the marinated paneer mixture and cook for some time. Slowly add cumin powder, red chili powder, coriander powder and mix well. Next add the chopped tomato and chopped coriander leaves and mix well. Add some salt and sugar and some warm water and cook till the gravy become thick with a lid. Remove from the heat. 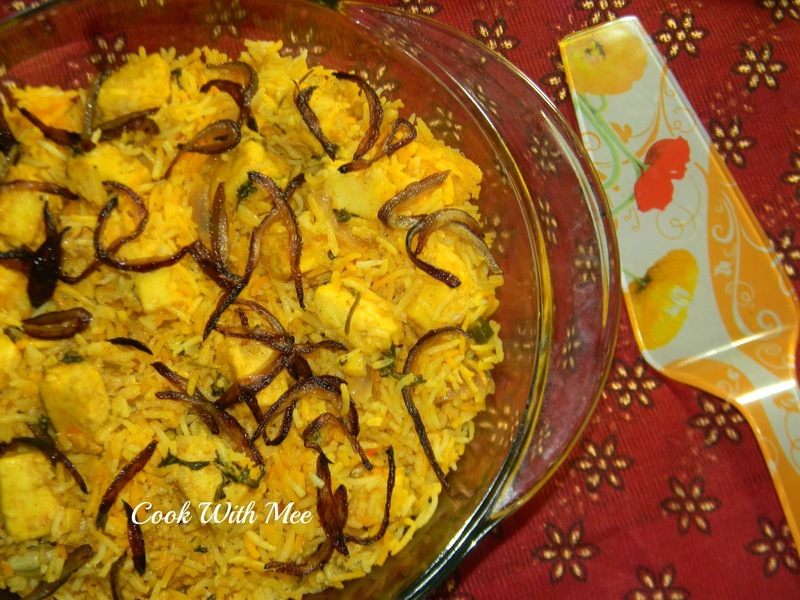 Now take one wide pan and in bottom add some ghee and slowly make one rice layer on top add half of the paneer mixture on top adds some salt, garamn masala powder, chopped ginger, two table spoon cream and soaked saffron milk. Repeat the process and add rest of the rice and paneer mixture with all the other ingredients. And cook it one low flame for another 10 mints. Your METHI PANEER BIRYANI is ready garnish with fried onions and serve hot with Raita….